AmDtuning.com with AutoAid/RCIB Insurance Racing has confirmed the signing of Scottish driver Rory Butcher for the 2018 Dunlop MSA British Touring Car Championship. Rory will embark on his first full season in the series with the West Thurrock-based outfit and will partner series returnee Tom Boardman in the team’s second MG6 GT. 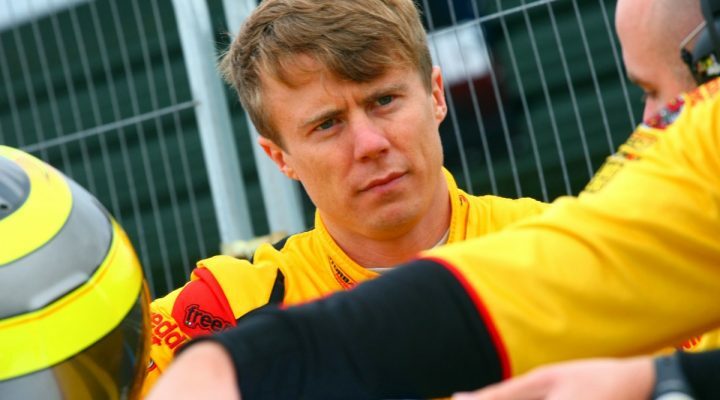 The 31-year-old joins AmDtuning.com having made his debut in the series last season, when he was called up by the Motorbase team for the final four rounds of the year in place of Luke Davenport after his injury in qualifying at Croft. On his first time in the car, Butcher snared a pair of top ten finishes at Knockhill and showed impressive speed through the remaining rounds, pushing regularly for more points finishes. Having sampled the MG for the first time during a test at Snetterton, Butcher is set for further pre-season running in the coming weeks ahead of the opening rounds of the season at Brands Hatch on the weekend of 7-8 April. “My move into the BTCC last season was all a bit last minute and I was thrown in at the deep end for my debut on home soil at Knockhill,” Butcher said. “So I was determined to try and get a place on the grid this year to build on what I learned from the final four rounds of 2017 and to start building a long-term BTCC career. “In January, it looked like it wasn’t going to be possible but then I spoke to Shaun (Hollamby) about the MG and with a lot of effort from the team and from my sponsors – who were eager to join me in the BTCC – we’ve been able to pull together a deal – which I’m absolutely delighted about. “It’s is such a strong series, particularly this season, that it hard to make too many predictions about what we can expect to achieve, but the team has shown what it can do in recent seasons and my goal is to regularly fight inside the points and push for some strong results as the season goes on. Shaun Hollamby, AmDtuning.com team boss, added: “Rory is a driver who we have been talking to for some time, and we are delighted to have concluded a deal for 2018. His career record speaks for itself, and the way he performed last year when he joined the grid in difficult circumstances was hugely impressive.